We sell Live steam railroad products! Click here to see! We bring your ideas into working reality. 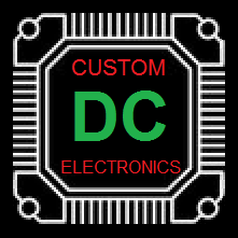 We offer custom design and manufacturing of electronic devices. Fill out our contact form and we will be in touch quickly to talk about your design concept or specific needs. If you can dream it, we can make it. There is no commitment to talk about your design ideas and we will quote and prototype as needed. Fill out our contact form and get your ideas flowing today. regarding our website. Thank you. Bring it to life here! New products coming soon! Take a look on our "Products" page for more details! Here at DC Custom Electronics, we are going green! We now offer the use of recycled parts! Recycled parts can be anything; capacitors, resistors, LEDs, wire, heat sinks, transistors, buttons, sensors, connectors, even solder can be recycled and used in one of our products. We thoroughly inspect and test these parts and guarantee them for the duration of the product. We take great pride in saying that we do our part to Reduce, Reuse and Recycle! Don't want to go green? No problem just opt out when placing your order by checking the "opt out of green parts"box.